Degassing Molten Aluminum - AdTech Metallurgical Materials Co.,Ltd. 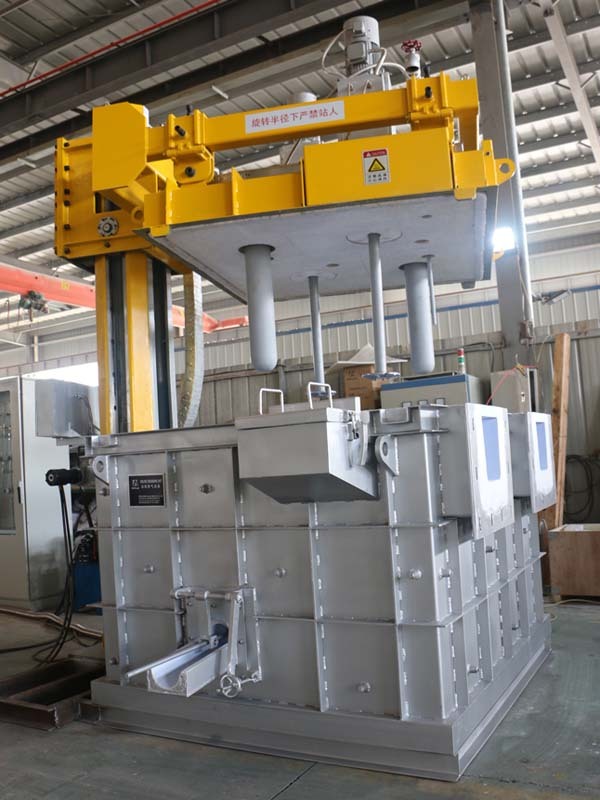 Once the ONLINE DEGASSING UNIT is fully lowered into Degassing Molten Aluminum with the shaft in place, the degassing operation can begin. The best shaft location is slightly off the centerline of the crucible or ladle to help avoid vortex formation with its circular rotation in the liquid metal. An offset distance of 2-4 in. from the centerline is usually sufficient. The use of a baffle plate also is a good idea, because the baffle opposes the circulation movement of metal and reduces vortex formation. With the RID in the proper location, the unit should be turned on and the shaft speed should be set to 300 RPM. The inert gas flow also should be on and operators should then adjust the gas flow rate and shaft speed. Gas flow should be increased until see gas bubbles are visible as they float to the surface of the liquid metal. As the gas flow increases, the size of the bubbles should increase. The desired result is a good dispersion of small bubbles while maintaining a relatively quiet surface. When an optimal combination of flow rate and shaft rotation speed is found, note the parameters for future use. Also note the total degassing time, which normally falls somewhere between four and eight minutes, unless the temperatures are very high or the amount of gas needed is low. Classification of cast aluminum alloys. Each cast aluminum alloy is designated by a four digit number with a decimal point separating the third and the forth digits. The second two digits identify aluminum alloy or indicate the alloy purity. In the alloys of the 1xx.x series the second two digits indicate the level of purity of the alloy – they are the same as the two digits to the right of the decimal point in the minimum concentration of aluminum (in percents): 150.0 means minimum 99.50% of aluminum in the alloy, 120.1 means minimum 99.20% of aluminum in the alloy. In all other groups of aluminum alloys (2xx.x through 9xx.x) the second two digits signify different alloys in the group. A modification of the original alloy or impurity limits is indicated by a serial letter before the numerical designation. The serial letters are assigned in alphabetical order starting with A but omitting I, O, Q, and X (the letter “X” is reserved for experimental alloys).